Steve Waugh found greatness when fighting with his back to the wall. He relished a fight and often got the best out of himself when he reduced a battle to that: individual fight with the opposition bowler. He thrived on it and often came out on top. He saved his career with that hundred against England. It gave him another year in the top flight cricket (he averaged 80 plus) and went out with a two month send off against the Indians the following Australian summer. Now even Chappell and Benaud are calling for his head. Now Ponting finds himself in a similar corner. Like Waugh, his greatness is not in question. His greatness is in front running and doing it like few others before him. Perhaps only Lara surpassed him among his contemporaries in doing it better. A man of dazzling feet movement befitting the best of dancers, his gift was also in great shot selection. His ability to reduce the game to a fight and his immense desire to win made him a stand out. Few can claim to have dominated the best attacks of their time like Ponting has. Over the years, invariably, he has fallen, learnt, succeeded and failed like the rest of us. Very few can achieve the maximum of their abilities. Ponting did, and touched greatness. Of that, there is little doubt. Not many would fault Ponting’s qualities as a batsman, but as a person he divides public opinion: considered short tempered, arrogant, loud mouthed by some, and as responsible, sharp man who understood his shortcomings and overcame them. Captaining Australia isn’t given to just any larrikin. It is a profile that is constantly scrutinized: by the public, media and even the prime minister. Shane Warne would count it among his top regrets not to captain Australia. Ponting did. His public acceptance to drinking problems as a young man and his switch to light beer showed him as man willing to learn and understand his position as an ambassador of his country. Soon, he was to become Australia’s finest batsman since Bradman and also its most successful captain. Not that he has always been right. For that matter, no one is. He would lose temper on occasions and his ugly side would show up, not least in the Sydney test of 2008 against India. In a fiasco that defied belief, he would end up ruffling a full media contingent that questioned his team’s behavior and integrity. Not that the Indians were innocent in that Test either. That the incident propelled a huge fallout of the Australian team with the rest of the world did shake him up and his teammates to take a deep look at themselves. Ponting’s attempts over the years of wanting to leave the game in a better shape than when he started playing is genuine. While gamesmanship may not be one of those, he feels strongly about over rates and substitutes. It has landed him in a quandary on a few occasions, especially in India where he has chosen the moral high ground over the push for a Test victory on more than one occasion . It didn’t go down well with many of his countrymen and former cricketers. That his lows as captain and as Test batsman should have come in India might be a personal regret. His successes far outweigh the inevitable failures. Like with all great players, ability doesn’t last forever. What’s accumulated in the mind of a master batsman like him cannot be discounted for the waning of the physique. But the acceptance of falling from greatness has to come from within. Often, that is the hardest to accept. After all, Viv Richards didn’t wear a helmet just because his reflexes slowed down as he was reaching his end. He dusted it off as a dip in form and not of eroding ability. Some live in denial. Viv’s last three years had no Test hundreds. Kapil Dev’s last few years were a folly and so were Jayasuriya’s last many. Now, Ponting is in danger of falling in that category. He has been found wanting playing the short ball over the last few seasons, yet he continues to play it. A signature shot, one that will always be associated with him, is suddenly a weakness. Falling over to straight deliveries and ending up in a walk to length deliveries are old problems now back to haunt him. Even stout Ponting supporters like Chappell and Benaud are calling for his head. 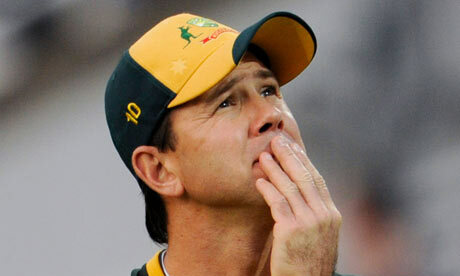 Ponting is still a mighty fine batsman. Perhaps he is hoping that there is a second wind for him like there was for Tendulkar and Dravid. Perhaps, being a good batsman is not enough for him. Once dipped and draped in greatness, it must be difficult to accept routine and the ordinary. Perhaps Wanderers will be his secret attempt at redemption; at greatness. A big innings would be most welcome for this struggling batsman and his tattered team. The end seems nearer than ever before, but may be, he can do a Waugh. Lovely article. If he does come out of his slump , it is going to make for some riveting cricket .It’s going to be a very interesting winter. I’m of the opinion that Ponting will walk away after this Test. Unless there is a dramatic turnaround in fortunes, and with a new selector set-up coming through shortly, time is running out for Ponting. And playing in a losing team hardly helps. Never knew you had sympathy for Ponting, Goutham. On top of his recent slump in form, I’d imagine his wrist injury/problem (which he’s been carrying for quite sometime) isn’t doing him any good either. But with big players, you’d want to believe that they end up writing their own destinies than someone else. You never know, but if he signs off after the series against India down under, he’d have still done a Steve Waugh. He is an enigma – mixture of very good with some very bad, especially in our viewpoint. But if you look at it holistically, though there have been some repetitive mistakes, he has often learnt from the past ones and moved on. There is little against him as a batsman than his record in India. Perhaps it is that only India have outdone them in his career(10 test wins to Australia; 12 to India). And also only India have kept Australia out on the park for long – sometimes 2 days fielding that has shown up on his batting while behind. Steve Waugh out did him in such batting scenarios. But, largely, he had superior ability to most!